As of 2014, the world has more than 7.1 billion people living, working, and using energy on our planet. 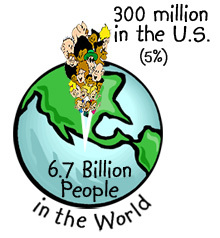 In our country alone, there are more than 317 million people. These people use energy for so many different activities; it is easiest to think of energy use by putting uses into major categories. The largest energy-use category in the U.S. is generating electricity. About 40% of all the energy used in this country goes to producing the electricity that provides light and powers our homes, businesses and industries. 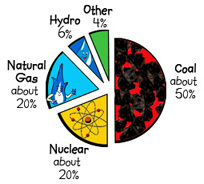 The next largest category is energy used for heating, followed by energy used for transportation. Of the electricity generated in this country, almost half comes from burning coal. Nuclear and natural gas tie for second place. These three non-renewable fuels account for almost 90% of the electricity created in our country. Burning fossil fuels releases carbon dioxide, which contributes to increases in greenhouse gases and raises concern that all this carbon dioxide entering our atmosphere could affect our planet's climate. Other countries throughout the world also burn fossil fuels that release carbon dioxide in amounts that vary according to their populations, natural resources and how much industry has developed. Another major contributor is volcanic eruptions and emissions. But greenhouse gases, including carbon dioxide, do not stay where they are released. The earth’s atmosphere is constantly mixing and moving, so what is released on one continent drifts to others. That’s why concern about peoples' actions causing climate change are global problems, not just the problem of one country or continent.